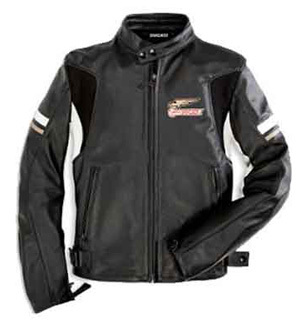 The Eagle jacket features a black, white and a touch of vintage color scheme with the Moto Ducati Eagle logo on the heart-side. Made entirely of cowhide, and includes CE approved protectors. In addition to its technical features,it is an extremely fashionable jacket, thanks to the original touch of the Eagle Ducati logo. Water-resistant black 3M Thinsulate removable lining . Remove all 5 pieces of armor and use it as a fashion jacket for hanging out when not riding.